Encapsulating a wonderful success story, Peter Nyathi, the founder of Tropical Mushrooms in Magaliesburg, has been awarded Pick n Pay’s 2019 Small Supplier of the Year. The annual award recognises the retailer’s top performing supplier from its Enterprise and Supplier Development programme. The winner is selected based on their business’ exceptional growth performance and job creation. Nyathi has more than doubled his farm’s capacity in the last 10 years and today his 18.9-hectare farm produces over 800 tonnes of mushrooms every year. 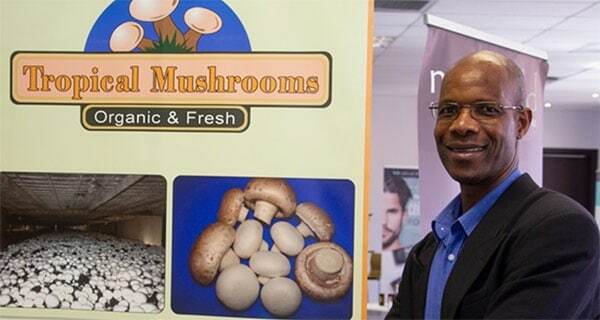 During Tropical Mushrooms’s first full year as a small supplier to Pick n Pay (2007), just over R2.5-million worth of mushrooms was bought by the retailer. Last year alone, Pick n Pay procured over R11-million from Tropical Mushrooms for over 330 stores in the inland regions. Nyathi’s dream was always to grow and produce the best mushrooms and he knew that one day he’d either run or own a business. He spent close to three years knocking on doors for funding before Absa’s Enterprise and Supplier Development Division approved his loan. “It was difficult as I didn’t even have enough capital for a 10% deposit. But Absa believed in me and took a shareholding in my company. In 1999 we started construction on the farm and our first crop went into the market the following year,” says Nyathi. He says that orders to small retailer stores, corner shops and distributors for hotels and catering services were steady, but the challenge was inconsistent pricing as the market was very competitive. This prompted him to explore getting his products on shelf at supermarket chains in 2006, and soon after he became a supplier to Pick n Pay through its Enterprise and Supplier Development programme. Limited in his production capacity, in 2008 Nyathi approached Absa again for more funding. With this, he doubled his production units and increased his employees from 64 to 110. Looking to further expand, Absa and the Ackerman Pick n Pay Foundation approved loan funding in 2013, and Nyathi was able to further increase his production by 50% and the number of employees to 150. By 2014, Nyathi had bought out Absa’s 31% shareholding and at the end of 2016, he had enough capacity to begin supplying another retailer. Since 2013, Nyathi has doubled his business’ turnover. Suzanne Ackerman-Berman, transformation director at Pick n Pay, says that big business has a major role to help small businesses, and in their case, small suppliers. Apart from building a strong and sustainable business over the years, Nyathi has also continued his focus on empowering and educating the Magaliesburg community. In 2005 Nyathi opened an employee trust, funded through a grant from the Department of Agriculture’s Land Redistribution for Agricultural Development. Qualifying employees received their grants, and the trust received an 18% shareholding in the company. In 2013, he applied for another grant and increased the shareholding to 35%. “My business was built from a human perspective with my fellow employees and in March 2018, this commitment paid off when we shared our first dividend payout together,” says Nyathi. Tropical Mushrooms shared R1m before tax with 60 qualifying beneficiary employees of the Trust. “It was a milestone in my life and Pick n Pay enabled the environment for this to happen. We hope we can pay out a dividend every year,” says Nyathi. “It is very good to know that someone is available to listen and support you when it is needed. It helps you run your business to the best of your ability, but it’s even more important to have a major retailer like Pick n Pay backing you,” concludes Nyathi.